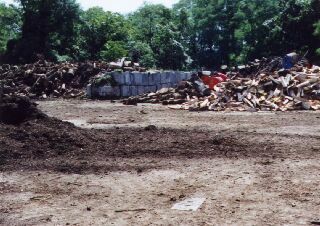 This is how the launch area of the former White Plains Nike missile site (NY-09), in Harrison, New York, looked on August 23rd, 1999. 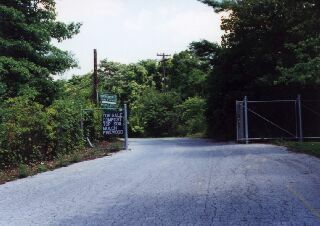 It was one of a ring of Nike missile sites that were constructed during the Cold War to defend the New York City area against Soviet bombers. It was in operation from 1955 to 1963 and used Nike-Ajax missiles. The twelve missile launchers are gone now and the three underground missile bunkers are filled in, but the missile blast plates can still be seen. 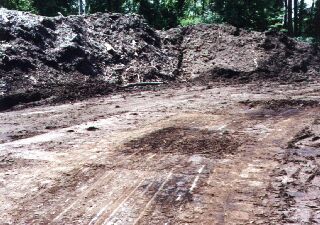 Part of the 34-acre site is now being used by the Town of Harrison as a composting facility. The launch area that is next to the trees in the first photo. I had visited this Nike site a few years earlier, before the Army Corps of Engineers had filled everything in, but, unfortunately, without a camera. At that time, the steel doors to some of the underground bunkers could still be seen and I opened the entrance to one of them, to see it filled with water. Some of the base plates for the launchers are still visible, and this one appears in the bottom center of the photo. 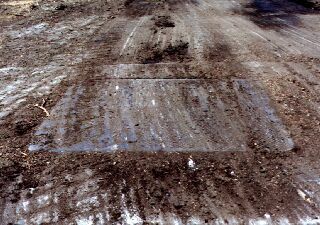 This is the entrance to the launch area, 500 feet above sea level, on Park Lane, between Indian Hill Road and Burns Road, and it is near Woodmans Cove on Rye Lake. A new housing development and road has recently been built near the Nike site, which may not appear on all maps, so it is actually closer to Horton Court than Burns Road. It is also near, and west of, the White Plains (HPN) Westchester County Airport.